Lexus loves Sriracha as much as the rest of us, so we talked to them about their one-of-a-kind, spicy collaboration with Huy Fong Foods, the Lexus Sriracha IS. Designing a car with Sriracha liquid in the steering wheel, in the trunk, and even in the key fob took them to Underwood Ranches in Ventura County California, the Huy Fong Foods factory where Sriracha is made, and to the garage of West Coast Customs (you know, Xzibit’s old joint). Here’s how they made the world’s most flamin’ car. Lexus bravely toured the Huy Fong Foods’ Irwindale, California, facilities for inspiration. It wasn’t for the feint of heart: Sriracha’s main ingredient, the red jalapeno chili pepper, is relatively mild in comparison to the torturous ghost pepper, but mashing up millions of them sends the Scoville scale skywards, and makes masks necessary at the factory. Lexus recreated the experience with a “Sriracha hot” heating option that cranks the heat all the way up to a July-like 85 degrees, a Sriracha liquid cast into the steering wheel, and the custom, spicy hot “Sriracha Red” paint job. 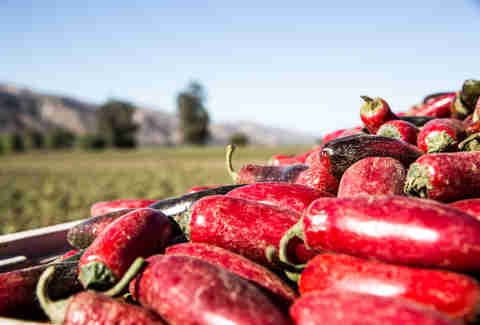 Little known fact: since the ‘80s, all the jalapeno peppers used to make Sriracha have come from Underwood Ranches, a single farm located about an hour away from the Huy Fong Foods factory. 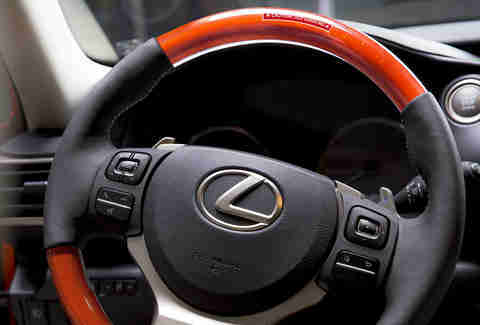 Lexus turned farm-to-bottle into farm-to-throttle by enlisting LA-based West Coast Customs to create the Sriracha IS. (And if they sound familiar, that’s because this is the crew behind all those custom jobs on MTV’s Pimp My Ride.) Together, they worked to create a Lexus that was still premium, but anything but bland. Extra synergy? Harvest time at Underwood Ranches’ 1,700 acres is October, which is when the Sriracha IS went into production. If you’re going to make a custom car inspired by a condiment, it should look like it’s absolutely drenched in it -- and the Lexus Sriracha IS definitely does. The peppers used to make Sriracha are only off the vine for a couple of hours before they are brought to the plant for processing, which gives the sauce that bright, bold red color (ok, maybe not that old bottle at the back of your fridge). West Coast Customs recreated it with a spot-on paint shade, and at one point they even put Sriracha in the paint to try to get the perfect color. Besides being Sriracha red, the paint that contains specks of gold -- reminiscent of chili flakes -- then is coated in a clear gloss, just like the real bottle. As every spicehead knows, it’s not legit Huy Fong Foods Sriracha without the signature green bottle cap. 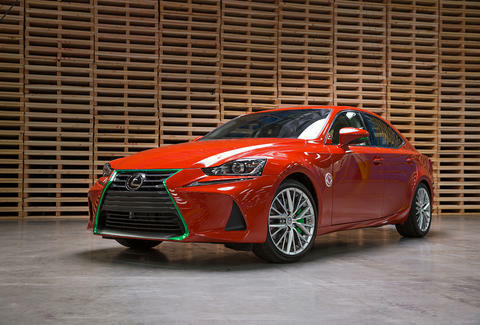 So Lexus wasn’t just thinking about the stuff in the bottle when they designed the Sriracha IS; they also incorporated lots of green elements into the car, like green interior mood lighting, a green-tipped grille, green-tipped exhaust pipes, and green stitching on the seats. And, lest you forget this is still a luxury car, there are even green-tipped chrome tips on the side view mirrors. It looks so much like a Sriracha bottle, we won’t blame you for trying to lick it. 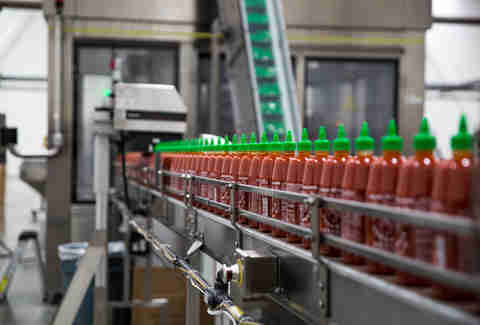 Just like the Lexus Sriracha IS, Sriracha itself was a totally custom creation for Huy Fong Foods founder, David Tran. He started making hot chili sauces in his native Vietnam in 1975, then bought an old pharmaceutical building, which he converted into a factory, upon his arrival in the U.S. in 1980. To this day, Tran has a hand in everything from designing the factory’s machinery to the barrels used to transport the peppers. 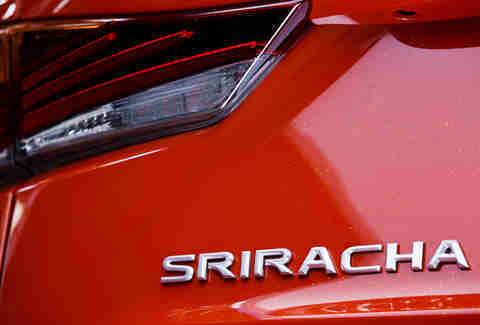 Similarly, each element of the Lexus Sriracha IS was specifically crafted by Lexus and West Coast Customs. While the car is modeled after Sriracha, the modern every-man condiment, it still has everything you would expect from a luxury brand. 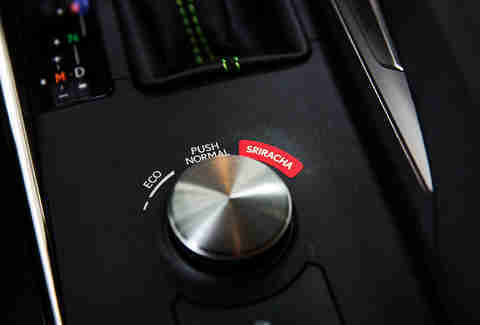 We’re talking hand-embroidering on the leather seats, a console with a high-tech digital display, and three driving modes, including a “Sriracha” mode for those who like to make “vroom” noises when they’re behind the wheel (guilty). It’s also all-wheel drive, has LED headlamps, and a design that makes a statement. All that stuff is also available in the new 2017 Lexus IS, which is still spicy in its own way -- though you’ll have to fill the trunk with Sriracha bottles yourself.